A pair of rural New Zealand police officers dramatically arrested the suspected Christchurch gunman 36 minutes after authorities were alerted, according to the prime minister who hailed their bravery Saturday. Prime Minister Jacinda Ardern said the alleged attacker, 28-year-old Australian Brenton Tarrant, would surely have killed even more people than the 49 worshippers he massacred in two mosques were it not for the policemen. “The offender was mobile, there were two other firearms in the vehicle that the offender was in, and it absolutely was his intention to continue with his attack,” Ardern told reporters in Christchurch. Grainy video apparently shot from a passing car shows the gunman’s light-colored vehicle at the side of a busy road, rammed against the curb by a police car and with one of its front wheels suspended in the air. Two police officers, one of whom appears to be armed only with a handgun, can be seen pointing their weapons at the open passenger-side door. 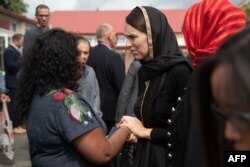 New Zealand Prime Minister Jacinda Ardern speaks with a woman during a visit to the Canterbury Refugee Center in Christchurch, March 16, 2019. “They were rural community cops I understand from Lincoln (a nearby town) who were present here. Anyone who has seen the footage ... they put New Zealand first,” Ardern said. “The individual charged was in custody 36 minutes from receiving the first call,” she said. The officers can be seen dragging a black-clad figure away from the vehicle, as motorists slowly drove by on the other side of the city road. Ardern said 39 people remained in hospital, 11 of them in intensive care.